IFTTT is a platform for you to let your SpotCam work with other popular smart devices or social networking or online services such as Amazon Alexa, Nest Thermostat and Philips Hue, Facebook, Twitter, and much more. With IFTTT you can easily use your SpotCam to automatically finish tasks you have to do manually before. Here you will see how it works! Before you start using your SpotCam with IFTTT service, you will need an IFTTT account. Visit here to create an IFTTT account or sign in if you already have an IFTTT account. 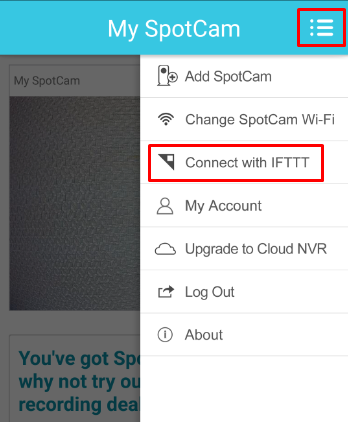 Once you log in to your SpotCam account, you can then connect your SpotCam with IFTTT service. To do so, simply click "Connect with IFTTT" in SpotCam App menu or click IFTTT tab in My SpotCam page if you are using web browser. Applet is a formula that follows the rule of IFTTT - If This Then That. You can easily find applets related to the device or service you like by using the filter at top left side of the IFTTT page. After you select an Applet you like to use, you will see a applet card looks like below, please swipe to turn on the service. You may be asked to log into your 3rd party device of service account and permit IFTTT service connect to your 3rd party service, please follow the instruction on screen then you are ready to go. 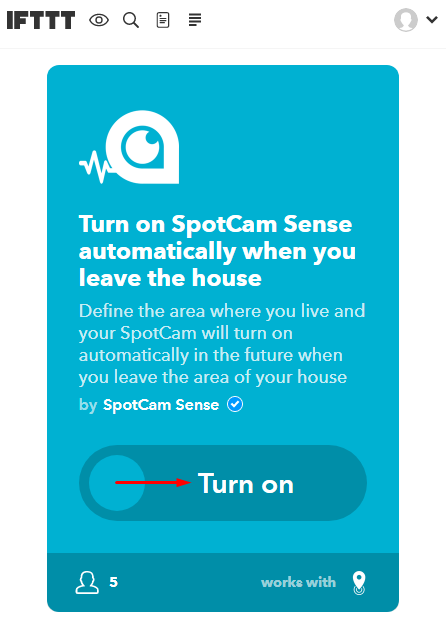 Alternatively, you can also visit SpotCam channel on IFTTT website (https://ifttt.com/spotcam) and log in to your IFTTT account and then create SpotCam applet you like there.